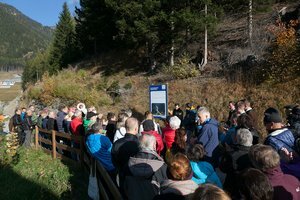 On Saturday, October 22nd 2016, the new walking trail in the Padaster valley (in Wolf, part of the township of Steinach am Brenner) was opened. Rev. Cons. 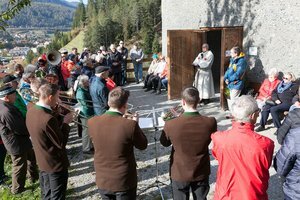 Albert Moser blessed the trail as part of the atmospheric ceremony to celebrate the one-year anniversary of the inauguration of the chapel of St. Wendelin in Siegreith. The horns section of the Steinach town band provided the musical accompaniment to the ceremony. 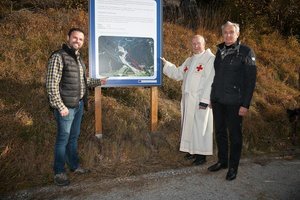 Because of the works on the Padaster valley disposal site, where a part of the spoil from the Brenner Base Tunnel will be permanently placed, several walking and mountain biking trails could no longer be used. 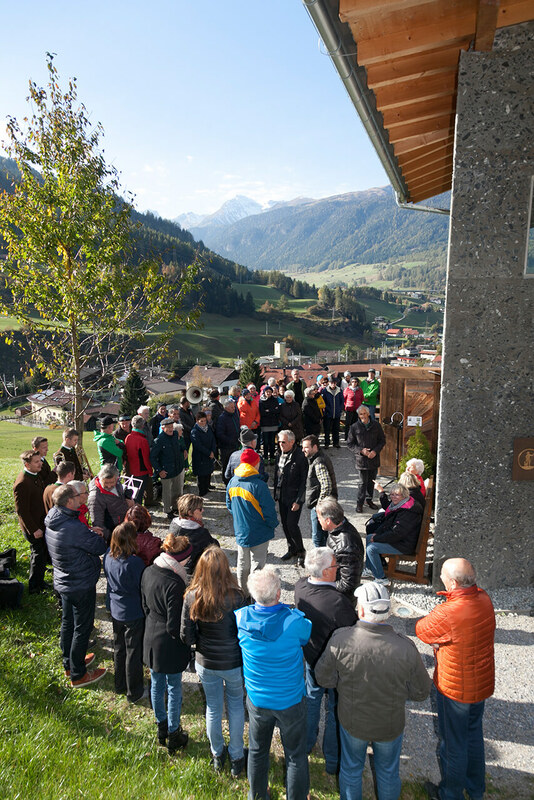 In order to ensure that the end of the Padaster valley can be reached while work is under way on the Brenner Base Tunnel, this new panoramic trail was built. 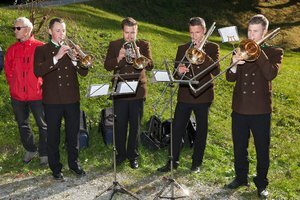 BBT SE, the project company, entrusted the town of Steinach with the construction and maintenance of the trail. 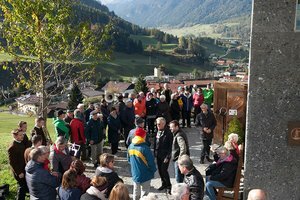 In his speech, Mr. Josef Hautz, the mayor of Steinach, thanked Dr. Helmut Gassebner of the district office of forestry inspectors in Steinach for laying out the route for the path, forest ranger Arthur Fidler for his work during construction and BBT SE for the financing. The 5.4 km path starts at the hydroelectric power plant and runs along the sunny side of the valley, the left side as one looks down the brook. It runs through a 500-m underground water pipe that is lit up when one walks through it. At the exit of the tunnel, the path crosses the Padaster brook and leads to the other side of the valley, back to the chapel of St. Wendelin at the opening of the valley. Parts of the path are equipped with steel steps and belvedere platforms. It takes about 2 hours to walk around the loop (a 650 m difference in altitude, with various ups and downs). The trail is closed in snow and ice season and is accessible again in the Spring. The panoramic trail allows glimpses of the work on the disposal site and of the spoil transport on the valley floor. Themed panels provide information on the final disposal of the spoil and on the construction of the 64-km railway tunnel.